Amber is a fascinating gem and makes beautiful jewellery. But it is much more than this. As our customers can testify, it works wonders for pain relief. The question I get asked most by customers is "can it help my mum (dad, sister, uncle, gran etc) with his/her arthritis"? The answer is it most certainly can. Arthritis is one pain condition that amber is particularly helpful in easing the discomfort of. The pain and discomfort of a chronic pain condition is ongoing and seemingly relentless. And this is also how most sufferers of arthritis feel. There is no let up, it is at the very core of their bones and seems to impact every movement they make. Whether for Osteoarthritis or Rheumatoid Arthritis, amber can make a difference. It acts as an anti-inflammatory and a pain reliever. I always caution in my chats with customers that amber will not cure any condition, and it may not help every sufferer, but the feedback we are getting can not be denied. Have a look at what some customers say in our Happy Customers page. And these are just a few of the comments we hear on a weekly basis. The most recent customer comment I had was from Brendan who summarized by saying "the pain in my neck has reduced dramatically, I have really cut back on the pain killers". And the fact that is a natural alternative ticks the boxes for most. 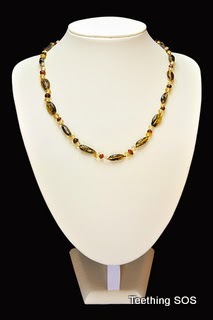 What could be simpler than wearing an amber necklace, bracelet or anklet to ease your pain? And what could be more natural than tree resin, which is what amber is, albeit 40 million years old. Now I don't claim that wearing amber will help you live this long! Would we want to? But amber can make your journey a little bit easier. For amber to help arthritis, or any other chronic condition, it must be worn as much as possible, all the time if possible. For that reason, the wearer needs a piece that they will be comfortable with. Would they prefer an necklace or bracelet? Whilst a necklace has more amber, and the more the better, a bracelet might suit them better. Or have you considered an anklet? We find this alternative suits many of our working customers who are unable to wear jewellery at work. Amber is very light and warm to wear, so it is very comfortable to wear continually. But you must consider what will suit your lifestyle best. Secondly, amber is not a quick fix and must be given a little time. It may be 3 weeks to a month before you can say you notice a difference. So patience is needed. Amber can not be compared to a couple of paracetamol in how it works. You cannot simply put it on and see results in half an hour. So for this reason, there must be a level of commitment on behalf of the wearer to this treatment. Thirdly, while amber needs to be worn all the time, from a care of amber point of view, it is best to remove it when showering and swimming. Water itself will do no harm but over time, soaps and chlorine will shorten the life of your amber. If it needs cleaning, just run under warm water from your tap and rub well to dry and polish with a soft cloth. Do not leave on a radiator as heat will damage it. So if arthritis is your particular pain, why not give amber a chance. Thanks Anderson. Good to know this. We would advocate any natural treatment, especially nutritional.